In between quilt projects, I like to make sets of pillow cases to give as grad student graduation gifts or shower gifts to brides. 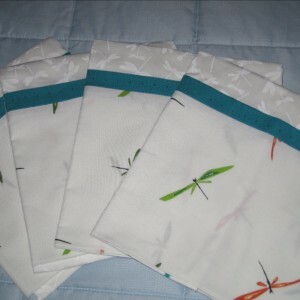 I especially like using a solid Cotton Lawn for the main body, and beautiful florals for the cuffs. 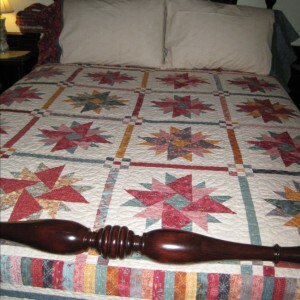 The cotton lawn fabric is so smooth and fine, and lovely to sleep on. I also like adding a flange trim for a touch of elegance. 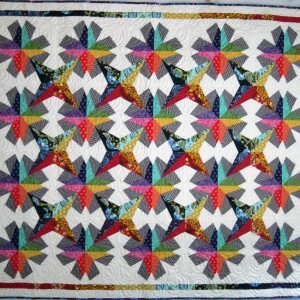 I use Jenny Doan's flange binding tutorial as a guideline for the flange trim. My friend's church has a 'baby shower' every Spring for young new mothers in need of baby supplies. 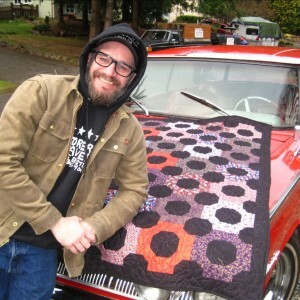 What a great local event for donating my charity quilts! 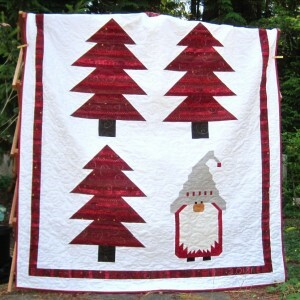 I have 5 quilts completed so far (11/2018) for the baby shower in 2019, all of them using the same pattern "Dapper Dan" by Camille Roskelley in the book "Simply Retro". The blocks were made from fat quarters I've collected for awhile, and the background and backside fabrics were purchased to coordinate. 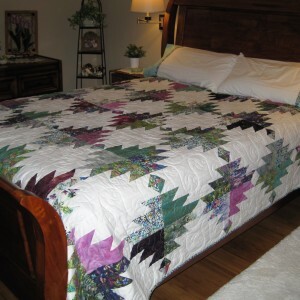 I pieced and quilted all of the quilts on my home sewing machine. 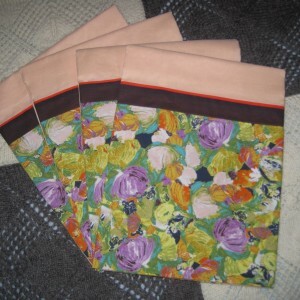 I loved creating all of these versions, but my favorite is the one I sewed first and did incorrectly - it's the one backed and bound in yellow. 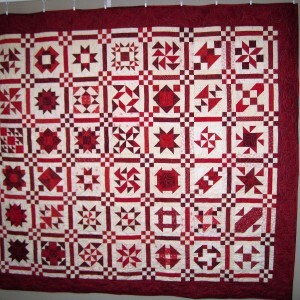 Each baby quilt is about 35"x45". I washed them all, tagged them with washing instructions for the new moms, and folded each one into 2-gallon Zip-Lock bag, hoping they'll stay fresh until Spring. 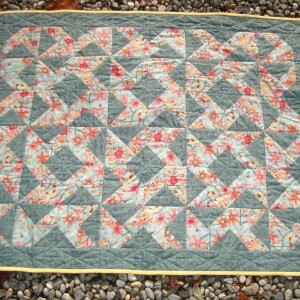 I love donation quilting! Posted by Peggy 11/12/2018. 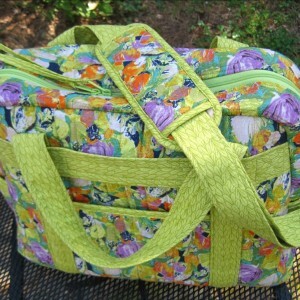 The Ultimate Travel Bag pattern is by Annie Unrein, found at ByAnnie.com and Craftsy. This project takes attention to detail, perseverance and a really sturdy sewing machine that will handle multiple layers of fabric, zipper and stabilizer. It also comes with a hefty price tag especially if you go with the hardware kit as suggested in the pattern, stabilizer, zippers, netting and quality quilting fabric. A walking foot is very useful, so better get one if you don't already have one. Cha-ching, cha-ching, cha-ching. All that being said, sewing the bag along with viewing the online Craftsy class is a must because of the very specialized techniques taught by Annie Unrein. I highly recommend the experience. 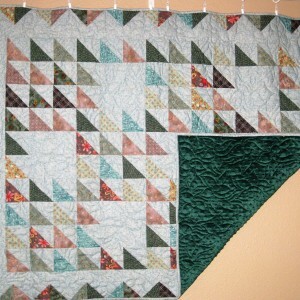 The fabric I used is AGF (Art Gallery Fabrics) Sage Cactus Flora - Lily, and Sage Painted Dessert - Night. 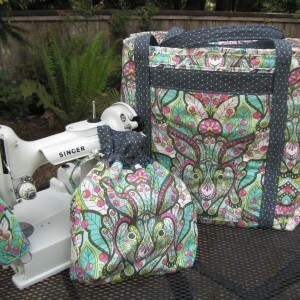 The bag is very sturdy and will easily accommodate my Singer Featherweight box plus fabric and tools/rulers for a sewing get-away. 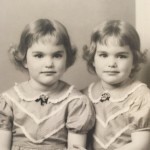 This project was completed January 31, 2018, and posted here by Peggy on May 31, 2018.